Fact Friday 170 - Charlotte's Crime Ridden Past? For much of the 19th and 20th centuries, Charlotte was simply a more difficult place to live than it is today. The occurrence of crime in the second decade of the 21st century is much lower than it was 50 years ago. Charlotte was named the crime capital of the state and the nation on several occasions during that period. According to a report released by the FBI in 1952, Charlotte led the state in crime by an overwhelming margin. Another such report, released in 1971, confirmed that Charlotte had a higher murder rate per capita than any city in the U.S. There are many reasons for the higher occurrence of crime, chief among them economic strife, access to education and racial oppression. 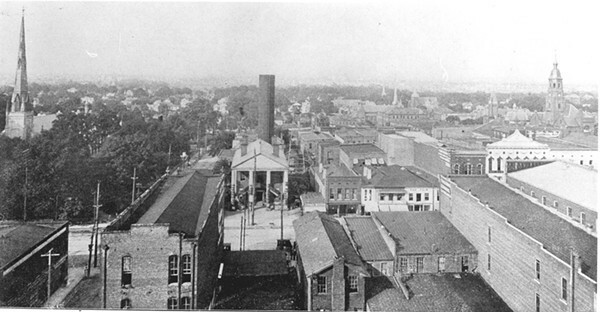 Charlotte was a thriving textile town at the end of the 1890s. That wave continued into the 20th century. The Queen City fared better economically than most cities during the Great Depression, though for laborers of all races, employment became increasingly hard to come by. It's no secret that blacks in Charlotte were - and, in many cases, are - not treated well. They were denied access to living in certain neighborhoods. At work, they weren't offered the same pay as their white colleagues. And some whites regarded them as undeserving of an equal standard of living. Consequently, there were very many poor black people struggling to survive. What did that combination equal? A high level of crime impacting and committed by members of Charlotte's poor and oppressed black community. Without access to many things most of the city's wealthy whites often took for granted, impoverished black residents were forced to do what they could to survive. That's not to say that poor whites didn't face challenges, as well. Those who made a living farming or from the textile and foundry industries were also plagued by economic hardship and frequent lack of employment. Among whites, it was the poor that were - once again - impacted by and committing crime. In a report from United Press International, dated July 31, 1966, former Charlotte Mayor Stan Brookshire was clear about what he felt were the roots of the city's "criminal epidemic." "It is indicative of poverty," he said. "And we are trying to do something." He never explained "something." The response from local clergy in the same report is practically laughable, especially considering that it was made at a time when churches in Charlotte were still predominantly segregated by race and economic status. "Established churches have little or no connection with poverty-stricken areas of the city," a minister at Christ Episcopal church said. "We couldn't get to all the problems that breed crimes just with Sunday school classes, but the churches are disturbed about these problems and have become alert to possible ways to aid in solutions." When I hear longtime residents reminisce about the "good ol' days" or a time when "life was easier," I am often motivated to point out that it wasn't so good or easy for everyone. And while I enjoy writing about the past immensely, it's not a place I would ever want to travel back to and get stuck in permanently. Although I have been told by a few readers that some of our city's history is best left forgotten, I vehemently disagree. It's an opportunity to learn about what was, and to properly evaluate where we are today. Note: In a 2018 ranking of the 100 most dangerous U.S. cities by Neighborhood Scout, Charlotte didn't make the list. Creative Loafing - Charlotte, "Question the Queen City: The City of Churches' Crime Ridden Past;" David Aaron Moore, 2014.